Students at Jerusalem's Boyar High School participate in archaeological excavations to help fund their trip to Poland's concentration camps. 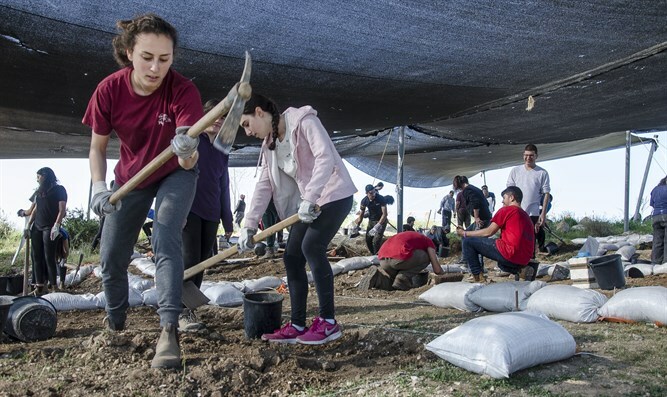 Eleventh grade students at Jerusalem's Boyar High school funded their trip to Poland by working for an entire week at an archaeological dig near Ramat Beit Shemesh, in a project funded by the Israel Antiquities Authority and the Construction and Housing Ministry. Many schools in Israel take their students on a trip to Poland, to tour destroyed Jewish homes, as well as concentration and death camps. Remains of a unnamed Jewish town from the Second Temple period were found at the site, which boasts a large and rare collection of eight mikves (ritual baths), as well as wells, stone apparatus used for manufacturing products, and underground tunnels. According to project managers Sara Hirschberg, Sara Levavi-Eilat, and Shua Kislevitz, "What's special about this town is the vast scope of its private mikves, which were built into private homes. Every home here had a mikve and a well. Some of the ones we've uncovered are simple, and some are much more complex and include an "otzar" into which rainwater fell. "It's interesting to see how the residents were so stringent about the laws of purity. "Underneath the residential homes and stone manufacturing apparatus, we've found another surprising discovery from the Bark Kokhba revolt, which took place in the second century CE: a series of twisted escape tunnels which connected to complex underground systems. One of the tunnels accessed an underground well, to provide water for those in hiding. "In a cave, we found ceramic pitchers and whole cooking pots, which survived the rebels. These findings prove that people were still living in the area after Jerusalem's destruction in the year 70 BCE." According to Israel Antiquities Authority Chairman Yisrael Hasson, "The trip to Poland aims to raise students' awareness of our nation's history, and to strengthen their commitment and sense of mutual responsibility. "It's no secret that the trip is expensive, and some parents have a difficult time funding it. "The Israel Antiquities Authority decided to work together with the Education Ministry to integrate Israeli youth into the archaeological excavations, and to reduce the cost of the trip to Poland. "In this way, we're developing the students' connection to their heritage and their sense of commitment even before they leave for Poland." Boyar Jerusalem Principal Dafna Menashe-Baruch said, "This unique project connects the history of Israel with studies of the Holocaust and the trip to Poland, and invites students to learn through research and personal experiences. "Leaving the classroom to learn in an archaeological excavation exposes students to many varied worlds of knowledge. Through the physically challenging work, they discover a topic which has fascinated many researchers. "Participating in this project is a great privilege and an unforgettable experience, and we are grateful to the staff of the Antiquities Authority for this educational and morally enriching experience, which connects our past to our present." Israel Antiquities Authority Judea Division archaeologist Amit Shedman said, "Together with the Construction and Housing Ministry, we have decided that when excavations are finished, this site will be preserved and opened to the public. It will be an archaeological site in the heart of a brand-new neighborhood."